I recently purchased a Marsboard A10 development board from the Shenzhen based company HAOYU Electronics. The shipment to Bulgaria took less than 2 weeks via Hongkong post. On the Marsboard’s site there are some links to software, which can be used, a wiki page, and a forum about the board, however I had to successfully deal with some troubles when trying to use the solutions provided. The board is advertised as being open, however not all issues about compilation and installation of software are clearly explained. Some images were not able to boot, the provided versions of the software were too old, e.g. Android version 4.0.4, Ubintu 12.06. The Linaro ubuntu distribution from the downloads page of Marsboard web site was running at very low frequency, with no change under heavy loads, probably due to poor bootloader configuration. I noticed in this post that a Fedora 19 distribution for Cubieboard and other ARM boards was released. Cubieboard is very similar to Marsboard. I decided to try to adapt it to Marsboard A10. The sync-ing flushes the cached information cached in memory to the physical medium. You may notice that it takes time, as a big part of the file was cached in the memory. After the sync command finishes, take out and re-insert the SD card. If you do this before the sync command has finished, the information saved on the SD card will become corrupt. The problem was that the Marsboard board was not present in the list of the boards. I had to compile u-boot for Marsboard A10, accommodate the configurations for Marsboard, create a sub-directory for Marsboard under the boards/sun4i directory, and add the Marsboard profile in the select-board.sh script. Now we need the marsboard.fex and script.bin files. From the marsboard-android-4.0.4-sdk.7z archive we can find the .fex file, as this post suggests. By comparison of the files with the *.fex files from the uboot partition of the Fedora 19 image, e.g. we can find that sys_config1.fex is the correct *.fex file to copy to the board directory. Now you can unplug the SD card from the card reader, plug it in the Marsboard, and enjoy your Fedora 19 installation. This entry was posted in hardware, software, Uncategorized and tagged 19, A10, A20, arm, fedora, installation, marsboard, xf86_64 on 2013/09/08 by admin. The next instruction is for cross-compiling the u-boot bootloader for Marsboard A10 on Fedora 19 x86_64. With little modifications it should be able to work with other versions of Fedora, and to compile u-boot for another ARM board, e.g. Marsboard A20, ot Cubieboard. Please note that I tried the arm-none-eabi toolchain, but I encountered a problem during the cross-compilation. The cross-compilation was failing with segmentation fault, so I switched to arm-linux-gnu toolchain. is not working, as the uboot-allwinner repository was removed. Don’t forget the trailing dash ‘–‘ of the arm-linux-gnu- string which is put into the CROSS_COMPILE variable. If everything compiled fine, you’ll have the u-boot.bin file in the root of the u-boot tree, and sunxi-spl.bin in the spl/ directory. 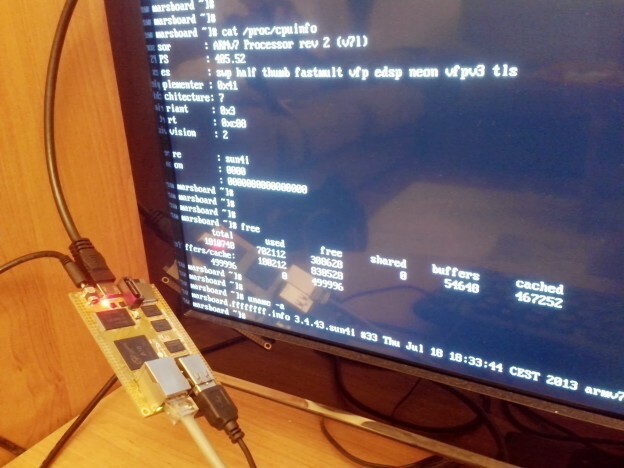 This entry was posted in hardware, software and tagged A10, A20, arm-linux-gnu, compilation, marsboard, u-boot on 2013/09/08 by admin.